Penyakit selsema babi merupakan satu penyakit baru yang muncul pertama kali di negara Mexico, ia dikatakan telah memasuki negara Thailand dan Singapura. Berikut ialah soalan soalan penting tentang selsema babi ini yang patut kita ambil perhatian di dalam mencegah wabak yang membawa maut ini. What is Swine Influenza?Swine Influenza (swine flu) is a respiratory disease of pigs caused by type A influenza virus that regularly causes outbreaks of influenza in pigs. Swine flu viruses cause high levels of illness and low death rates in pigs. 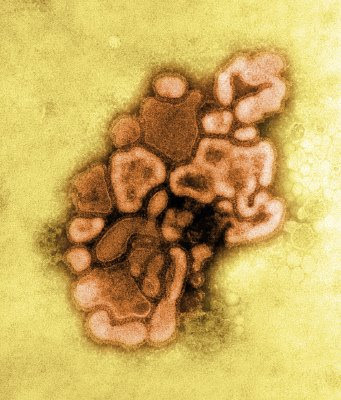 Swine influenza viruses may circulate among swine throughout the year, but most outbreaks occur during the late fall and winter months similar to outbreaks in humans. The classical swine flu virus (an influenza type A H1N1 virus) was first isolated from a pig in 1930. How many swine flu viruses are there?Like all influenza viruses, swine flu viruses change constantly. Pigs can be infected by avian influenza and human influenza viruses as well as swine influenza viruses. When influenza viruses from different species infect pigs, the viruses can reassort (i.e. swap genes) and new viruses that are a mix of swine, human and/or avian influenza viruses can emerge. Over the years, different variations of swine flu viruses have emerged. At this time, there are 4 main influenza type A virus subtypes that have been isolated in pigs : H1N1, H1N2, H3N2, and H3N1. However, most of the recently isolated influenza viruses from pigs have been H1N1 virusesCan humans catch swine flu?Swine flu viruses do not normally infect humans. However, sporadic human infections with swine flu have occurred. Most commonly, these cases occur in persons with direct exposure to pigs (e.g. children near pigs at a fair or workers in the swine industry). In addition, there have been documented cases of one person spreading swine flu to others. For example, an outbreak of apparent swine flu infection in pigs in Wisconsin in 1988 resulted in multiple human infections, and, although no community outbreak resulted, there was antibody evidence of virus transmission from the patient to health care workers who had close contact with the patient.In short, spread of swine flu can occur in 2 ways :* Through contact with infected pigs or environments contaminated with swine flu viruses. * Through contact with a person with swine flu. Human-to-human spread of swine flu has been documented also and is thought to occur in the same way as seasonal flu. Influenza is thought to spread mainly person-to-person through coughing or sneezing of infected people.How common is swine flu infection in humans?In the past, approximately one human swine influenza virus infection every one to two years in the U.S., but from December 2005 through February 2009, 12 cases of human infection with swine influenza have been reported.What are the symptoms of swine flu in humans?The symptoms of swine flu in people are expected to be similar to the symptoms of regular human seasonal influenza and include fever, lethargy, lack of appetite and coughing. Some people with swine flu also have reported runny nose, sore throat, nausea, vomiting and diarrhea. Probably the most well known is an outbreak of swine flu among soldiers in Fort Dix, New Jersey in 1976. The virus caused disease with x-ray evidence of pneumonia in at least 4 soldiers and 1 death – all of these patients had previously been healthy. The virus was transmitted to close contacts in a basic training environment, with limited transmission outside the basic training group. The virus is thought to have circulated for a month and disappeared. This entry was posted on Thursday, April 30th, 2009 at 3:53 pm	and is filed under Berita, Tip Kesihatan, rawatan. You can follow any responses to this entry through the RSS 2.0 feed. You can leave a response, or trackback from your own site. Sungguh menakutkan… virus selsema babi ini. Dari apa yg saya faham setelah membaca ertikel di atas bahaya virus ini boleh terkena kepada sesiapa sahaja.. tidak mengira kita makan babi atau tidak. boleh saya tanya megenai wabak ini….. ? apa sebenarnya punca wabak ini berlaku? mengapa wabak ini dinamakam selsema babi,adakah berpunca dari babi ? saya sangat takut apabila selsema babi ini wujudkan.boleh saya tanya mengenai wabak ini……? saya adalah saorang yang disahkkan olih doktor pakar jantung sabagai pesakit jantung yang telah berapa kali keluar masuk wad jantung dihospital pulau pinang sehingga telah merasa jemu duduk dalam wad jantung dan mencari jalan untuk berubat secara tradisonal. Baru baru ini ada saorang hamba allah telah membawa saya berjumpa dengan saorang yang dapat menolong masalah saya ini .satelah dirawat dan dibuat obat menggunakan ramuan ramuan kampong sekarang ini saya telah disahkan olih doktor yang merawat saya tiada lagi saluran sumbat atau lain lain. blh saya tahu apakah punca h1n1..?? blew wabak nie nak abis??????????? ?xd crew nak atasinyew kew?????? ?